PicoSure is a new laser tattoo removal treatment that uses innovative picosecond technology. This new system delivers ultra-short pulse bursts of energy that are able to treat darker, more complex tattoos – even if they’ve previously resisted traditional Q-switch laser treatment. It can even treat blue and green ink effectively, colours which are often stubborn to remove. 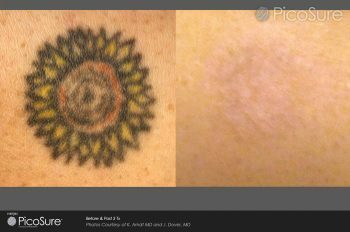 In Q-switch laser tattoo removal, light is used to break down ink particles until they’re small enough to be reabsorbed and flushed out by the body. PicoSure is even more effective because the photomechanical effect created by the pulses shatters the ink into even tinier pieces, meaning they’re reabsorbed faster. How long it actually takes depends on the size of the tattoo you’re removing; it can take just a few minutes per treatment for a tiny tat. Of course we can’t guarantee it won’t hurt a little; most people describe it as having a rubber band snapped against the skin, or like a mild sunburn. Once you’re done being treated, the pain should go away quickly. If you’re worried, ask for a numbing or cooling cream to be applied before your treatment. PicoSure also has significantly less possible side effects than Q-switch laser treatments. It’s unlikely you’ll experience any, but possible side effects include temporary blistering, a little bleeding or scabbing (just cover the tattoo with a bandage if this happens) and mild to moderate itching. PicoSure, unlike Q-switch lasers, does not usually leave scars as heat is not required to break up the tattoo. For more information about PicoSure tattoo removal treatments, contact us at Pulse Light Clinic today to arrange a chat. We’ll be happy to help you with any questions you may have, and get you on the road to having that tattoo removed from your skin – and your memory!